Gary Louris and Django Haskins have produced an album that fully integrates the sounds that each have forged on their own. Supergroups come and supergroups go, but these days the term is used only infrequently. In many cases, the pairing of veteran artists is more akin to a momentarily solo sojourn that finds two-like minded musicians joining forces for a one-off project before quietly returning to their day jobs. That seems to be the case with Au Pair, a duo consisting of two notable frontmen in each’s own right: Gary Louris of the Jayhawks and Django Haskins of the lesser known, but equally impressive Old Ceremony. 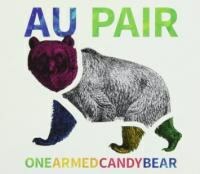 Their new album, One Armed Candy Bear is certainly good for a variety of reasons, but none more so than the way these two have melded their talents, producing an LP that fully integrates the sounds that each forged on their own. It’s little surprise then that One Armed Candy Bear doesn’t represent a dramatic departure for either of these individuals. While certain songs -- “In Every Window,” “Middle Distance” and “Sullivan’s Ghost” -- would appear a bit too sprightly for either man’s individual entity. For the most part however, they find quite a lot of common ground. There’s a supple roots sound pervading the disc as a whole, and a number of tunes wouldn’t sound out of place on an album by either the Jayhawks or the Old Ceremony, although truth be told the former seems to dominate. “Night Falls Early” and “Waiting for the First Time” recall the breezy wistfulness of Tomorrow the Green Grass, Smile, and Sound of Lies given the emphasis on acoustic textures and minimal accompaniment. At the same time, “One Eyed Crier” and “Baby on Trial” convey the sort of dreamy repose Old Ceremony has staked its claim to over the course of its albums, a sound that’s seemingly unobtrusive but haunting nevertheless. The fact that Louris and Haskins have deliberately mooted their approach to this initial collaboration, shows their intent is to keep the sound decidedly low key as if to downplay any hint of hype or egotistical excess. Whether or not Au Pair is a longterm venture remains to be seen, but with both men’s bands apparently still going strong, it’s likely to be a side project at best, one with enough inducement of its own to make fans hope for a reprise. No, it defies the sizzle and splash that trumpets the arrival of a supergroup and yes, it is unassuming in practically every regard. But it is a worthy digression and one that comes across as somewhat effortless at that. Fans of both men’s bands ought to enjoy it and consider it key to their collections.